The numbers containing two to four carbon atoms are gases; five to seventeen is liquid; eighteen on words solid at room temperature and they burns in air with a luminous flame. In general, the physical properties of the alkenes are similar to those of alkenes, since the alkenes are only weak van der Walls attractive forces. Owing to the presence of double bond, the Alkenes undergo a large number of addition reactions, but under special conditions they also undergo substitution reactions. The high reactivity of the olifinic bond is due to presence of two π- electrons, and when addition occurs, the trigonal arrangement in the alkene changed to the tetrahedral arrangement in the saturated compound produced. Alkenes addition reactions involve an electrophile in the first step. This is the rate – determining step, and the intermediate carbocation then reacts rapidly with a neuclophile. One way of measuring the stability of an alkene is the determination of its heat of hydrogenation. Since the reaction is exothermic, the smaller ∆H is (numerically), the more stable is the alkene relative to its parent alkane. Thus, it is only possible to compare the stabilities of different alkenes which produce same alkane on hydrogenation. This arises from the fact that the enthalpy of formation of alkenes is not purely additive properties; it is also depends on steric effects and these tend to vary from molecule to molecule. Since three n- butenes all gives the n-butane on reduction. This order may be explained in terms of steric effect and hyperconjugation. In but-1-ene, steric repulsion is virtually absent. In but-2-enes, the two methyl group in cis isomer being closer together than in the trans isomer, experience greater steric repulsion and consequently the cis form is under greater strain than the trans. Thus steric repulsion destabilizes a molecule. On other hand, hyperconjugation stabilises a molecule, and is small in but-1-ene but much larger in but-2-enes. Since trans but-2-ene is the most stable isomer, it follows that hyperconjugation has greater stabilising effect then steric repulsion a desstabilising effect. Arrange the following Alkenes in order of increasing stability and give your reasons. An addition reaction, in organic chemistry, is in its simplest terms an organic reaction where two or more molecules combine to form the larger one and the product is called additive compound. 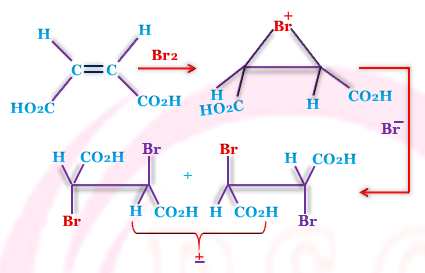 Alkenes are readily hydrogenated under pressure in the presence of catalyst. Finely divided platinum and palladium are effective at room temperature; nickel on a support requires a temperature between 200⁰C and 300⁰C; Raney nickel is effective at room temperature and atmospheric pressure. Alkenes form addition compounds with chlorine or bromine. Halogen addition can take place either by a heterolytic (polar) or a free-radical mechanism. Halogen addition radially occurs in solution, in the absence of light or peroxides and is catalyzed by inorganic halides. Eathyene reacts with bromine in aqueous sodium chloride solution, the products are eatylene dibromide and 1-bromo-2-chloroeathane, no eathylene dichloride is obtained. Addition of halogen is usually predominantly trans, that is the addition is streoselective (one stereo-isomer predominates over the other). As for example, the addition of bromine to maleic acid gives enantiomers of dibromosuccinic acid, which can result only from trans addition. The addition of halogen to alkenes, occurs in the absence of light, is polar. CH₂=CH₂ → CH₂Cl - CH₂˙ → CH₂Cl - CH₂Cl + Cl˙, etc. Ethylene add hydrogen bromide to from ethyl bromide. (this is also the order of acid strength). The conditions for the addition are similar to those for halogens, only the addition of hydrogen fluoride is occurs under pressure. As for example propane might add on hydrogen iodide to from propyl iodide or isopropyl iodide. Markownikoff studied many reactions of this kind, and as a result of his work, formulated the following rule. The negative part of the addendum acids on to the carbon atom that is joined to the less number of hydrogen atoms. In the case of the halogen acids the halogen atom is the negative part. So according to Markownikoff rule, isopropyl halide is obtained. Markownikoff’s Rule is empirical, but may be explained theoretically on the basis that the addition occurs by a polar mechanism. As with the halogen, the addition of halogen acid is an electrophilic reaction, the proton adding fast, followed by halide ion. Also, the addition is predominantly trans, and this may explain in terms of the formation of a bridge carbonium ion. Now consider the case of propene. Since the methyl group has a +I effect, the π electrons are displaced towards the terminal carbon atom which, in consequence, acquires a negative charge. Thus, the proton added on to the carbon fastest from the methyl group, and the halide ion then adds to the carbonium ion. An alternative explanation for Markownikoff's rule is in terms of of stabilities of carbonium ions. Represent as primary, Secondary and Tertiary carbonium ion. Which of the following carbocation is more stable? (i) CH₃CH₂⁺ (ii) CH₃(CH₃)CH⁺ (iii) CH₃(CH₃)C⁺CH₃. Explanation for the order of the stability of these carbocation by hyperconjugation. The number of hydrogen atoms available for hyperconjugation is 3 for (i), 6 for (ii) and 9 for (ii). Consequently, (iii) would be expected to be the most stable. Physical and Chemical Properties of Alkenes, Stabilities of Alkenes, Reactions of alkenes and Markownikoff Rule.